Jess Fishlock scored a hat-trick as Wales thrashed Montenegro 4-0 to keep their hopes of catching Group 6 leaders England alive in Bangor. Watford's Sarah Wiltshire fired Wales in front after a mistake by Montenegro goalkeeper Marija Zizic. Captain Fishlock converted Natasha Harding's low cross before curling home a free-kick. The Seattle Reign player added a third after the break as Wales tightened their grip on second place. England won 4-0 against the Ukraine maintaining their 100% record - still five points ahead of Wales. Only one team qualifies from each group, with the best four second-placed teams going into a play-off for a chance to reach the tournament in Canada in 2015. The results means Wales are now six points above third placed Ukraine, who have two games in hand. It was an dominant performance by Jarmo Matikainen's side from start to finish. 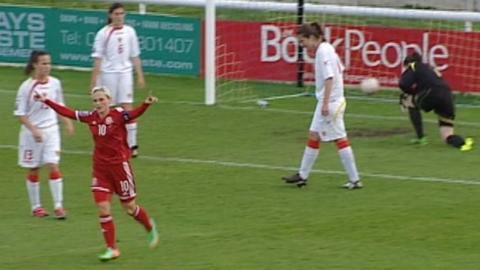 Montenegro failed to threaten the Welsh goal and Fishlock was in inspirational form throughout. Just 12 minutes in, Montenegro keeper Zizic failed to hold onto the Welsh skipper's stinging shot from a long range free-kick. The ball fell to Wiltshire who made no mistake, tapping the ball into the net from close range. Montenegro found it difficult to contain the Welsh with Fishlock dictating and orchestrating most of Wales' attacking play from midfield. Bristol Academy striker Harding also proved a threat with her pace and her cut back, after getting in behind the Montenegro defence, was turned home by Fishlock just two minutes after Wiltshire's opener. Fishlock fired a free-kick into the corner of the net as Wales threatened to run riot. Montenegro changed their goalkeeper at half-time but Iva Milacic was unable to stop Fishlock from completing her hat-trick shortly after coming on, as the Woman of the match turned in another low cross from Harding. Wales continued to press and could have scored more. Harding scuffed a shot wide in front of an open goal and Milacic did well to deny Yeovil Town's Helen Bleazard, palming away her powerful 30 yard free kick. Matikainen's team are now unbeaten in their last six matches in the group - with three wins and three draws - since losing to England in October. Wales' next qualifier is against fifth placed Turkey on 14 June in Haverfordwest. Wales manager Jarmo Matikainen: ""Jess [Fishlock] had another outstanding performance tonight. The margins between the teams in this group are actually very, very small. "The important thing is that you don't trip up over hurdles such as this. Three points is what mattered today and the girls did well."